A few hours from now, the most awaited 7th game of the 2010 NBA Finals will finally begin. As we all know, this year's finalists are the greatest NBA rivalries of all time, Los Angeles Lakers vs Boston Celtics. 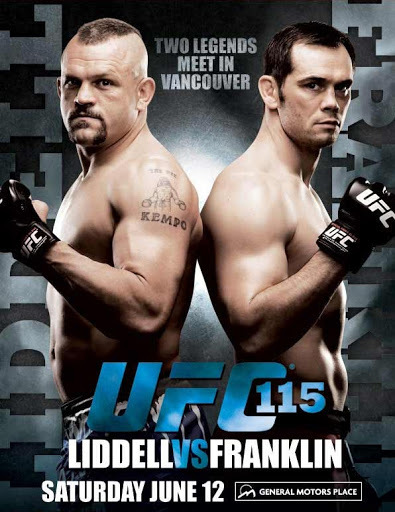 History really repeats itself, just like what will happen tonight at Staples Center, Los Angeles, California. This is the 12th time the teams have met in the championship round. These two teams first met last November 9, 1948, but it was not a championship game. The Celtics won nine of their previous 11 championship games against the Lakers, winning in 1959, 1962, 1963, 1965, 1966, 1968, 1969, 1984, and 2008, while the Lakers won in 1985 and 1987. The Celtics currently hold the most NBA Championships with a total of 17. On the other hand, the Lakers won 15 times in the NBA finals. The Celtics-Lakers rivalry hit its peak in the 1980s when Larry Bird of the Celtics and Magic Johnson of the Lakers led their teams to win a combined eight NBA titles in the decade, with the Lakers winning five and the Celtics winning three. 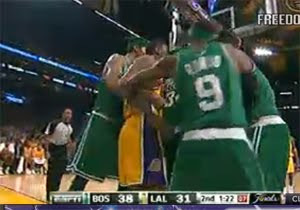 As we all know, Celtics and the Lakers met in the finals 2 years ago. The Boston Celtics won last 2008 four games to two. This 2010 the Lakers will be the team with home-court advantage. Will the Boston Celtics still win against the Lakers? Or will the Lakers avenge their defeat and be the champion of the 2010 NBA Finals? 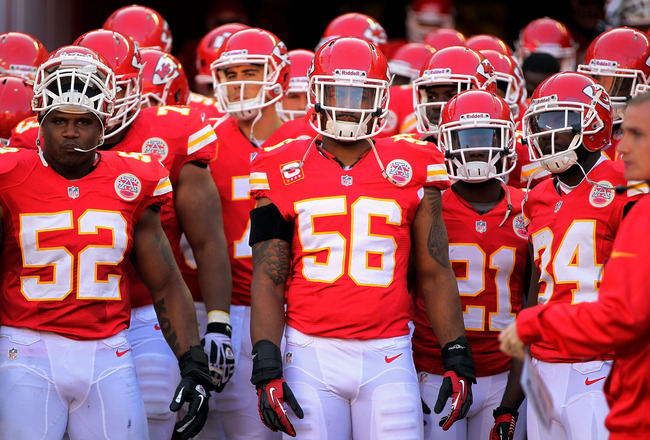 This year, new players for both teams have entered. Notable new players are Ron Artest by the Lakers and Rajon Rondo by the Celtics. The key to both team's victory is teamwork. Whoever plays better and has better teamwork will obviously win tonight's Finals. Tonight will be another exciting and historic night as the two teams tied 3-3 in the previous 6 games. Fans will scream, cheer and give their best support for their respective teams. It's one of the biggest games in the history of the NBA. I bet more sports fanatics will watch NBA tonight rather than watching soccer games in the FIFA World Cup. But if the finals of the World Cup and NBA will happen simultaneously, I'm not sure where's the attention will be with the majority of sport fanatics around the world. But most probably they will be watching the World Cup, because it's the whole "world, not just "nationals". That's just my mere hypothesis, don't judge just me please. 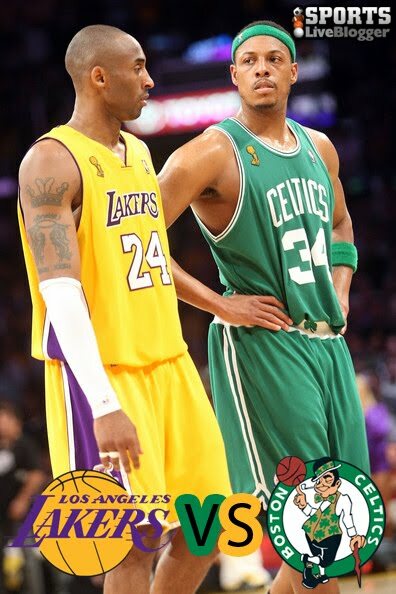 Anyway, tonight at exactly 9:00 PM E.T., the Lakers will meet the Celtics once again in the Game 7 of the 2010 NBA Finals. We will not be live streaming tonight's game, but we'll give you several options of where to watch the 2010 NBA Finals Game 7. You can watch the finals tonight in various SOPCast channels, it will also be available in uStream and Justin TV. That' all for now. More updates will be posted later before the game starts. You can also Google Celtics-Lakers or Lakers-Celtics for live score updates right in your Google homepage. You can also add this Google Gadget to your iGoogle for live score updates of the Celtics vs Lakers basketball game tonight. We offer self paced testking 1Y0-A17 training program to help you pass certification exam on time! Download real testking 642-504 exam questions and testking 70-643 practice test to prepare and pass real exam with ease. June 17, 2010 9:02 PM ET: The game has just started! Lakers and Celtics fans are cheering and screaming right now inside Staples Center, Los Angeles. June 17, 2010 9:15 PM ET: After a few minutes, the score is now 10-9 in favor of the Boston Celtics. Wow, it seems that the Boston Celtics are leading and doing well in the first quarter. June 17, 2010 9:27 PM ET: The Celtics are still leading with the score of 17, while the Lakers only scored 14. June 17, 2010 9:29 PM ET: 1 minute and 22 seconds left for the first quarter. The score is now 21-14 in favor of the Celtics. June 17, 2010 9:35 PM ET: 2nd quarter has just started, the Lakers scored first in this quarter. The score is now 23-16 in favor of the Celtics. Will the Lakers beat the Celtics? Let's find out later! June 17, 2010 9:42 PM ET: I'll just take a break. I'll be posting more updates later. Btw, the live stream above is for real. No surveys or whatsoever. Just wait for the ads to close, then you can watch Celtics vs Lakers Game 7 for free. June 17, 2010 9:57 PM ET: If you've noticed that the live stream loads forever and you can't watch a thing, just refresh the page. It works just fine. I have updated the stream source a few seconds ago. June 17, 2010 10:01 PM ET: As you can see in the live stream screen shot below, the score is now 31-29 in favor of the Celtics. 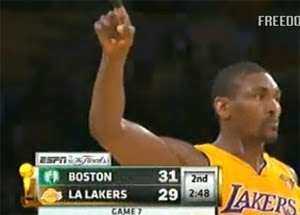 Oh boy, the Lakers are too close and it seems they can outscore the Celtics in the 2nd Quarter. 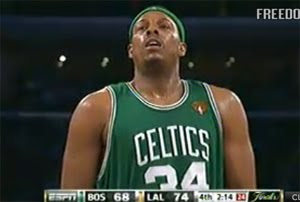 June 17, 2010 10:03 PM ET: The Celtics made 2 points during the free throw. The score is now 33-29 in favor of the Celtics. June 17, 2010 10:05 PM ET: It looks like there's a foul. A free throw is given to the Lakers. The score is now 38-32 after the free throw. June 17, 2010 10:10 PM ET: Ooops.. it looks like there's another foul. A free throw is given to the Boston Celtics this time. June 17, 2010 10:12 PM ET: The first half has just finished. It's break time guys! The score is 40-34. The Celtics are still leading after the first 2 quarters. It looks like the Boston Celtics are winning, but we still can't say. There's two quarters to go and the Lakers will never let their fans down... at their home court! 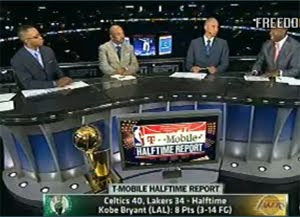 June 17, 2010 10:18 PM ET: Below is the screenshot of the half-time report of the NBA Finals 2010. More updates will be posted as the game goes on. June 17, 2010 10:18 PM ET: A few minutes from now, the 3rd quarter will finally kick-off. Let's see who will dominate this time. Will it be the Lakers or the Celtics? Who will win tonight's game? The Celtics are leading, but the Lakers can still make it! June 17, 2010 10:43 PM ET: 7 minutes and 43 seconds left in the 3rd quarter and the score is 49-37 in favor of the Boston Celtics. It looks like the Celtics will win tonight's match and will be the 2010 NBA Champions! June 17, 2010 11:07 PM ET: The excitement is at its peak! We are now on the 4th quarter at 10:53. People in the court are shouting defense defense! The score is now 57-55. The Boston Celtics are leading with 2 points. June 17, 2010 11:21 PM ET: The score now tied at 61-61. 7 minutes left in the last quarter of NBA Finals 2010! The heat is at the pinnacle right now! Everybody is cheering for the Lakers, because it's their home court. June 17, 2010 11:25 PM ET: And we have another time out! 5 minutes and 56 seconds left before the 4th quarter ends! The score tied at 64-64. June 17, 2010 11:33 PM ET: Wow! The Lakers are now leading! 64-65! And after the 3-point shot, the score is now 64-68! It looks like the Los Angeles Lakers are gonna win tonight!!! June 17, 2010 11:33 PM ET: Whoaaaaaa! The score is now 64-70 right after the free throw given to the Lakers. The Lakers are now leading the game! 4 munites remaining! June 17, 2010 11:36 PM ET: The score is now 66-70! The Lakers are leading with 4 points! The fans are going wild right now! We are now at the climax of tonight's game! June 17, 2010 11:39 PM ET: 2 minutes and 40 seconds remaining! The score is now 68-71 in favor of the Lakers! There's another foul and a free throw is given to the Lakers. The score is now 68-73 in favor of the Lakers! Below are some of the game stills before the 1:30 time out. June 17, 2010 11:40 PM ET: And we have another time out! Celtics down by 6 with a minute and a half game to go in Game 7! 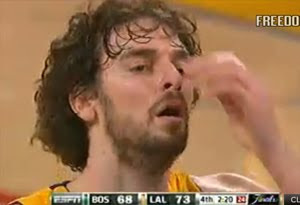 June 17, 2010 11:46 PM ET: 30 seconds remaining, the score is now 76-79 in favor of the Lakers! June 17, 2010 11:47 PM ET: And we have another timeout! 25 seconds remaining, the score is now 76-81 in favor of the Lakers! Will the Celtics cope up? June 17, 2010 11:47 PM ET: Wow! The Celtics scored! 13 seconds remaining. It's now 79-81! The Lakers are only leading with 2 points guys! Oh boy! 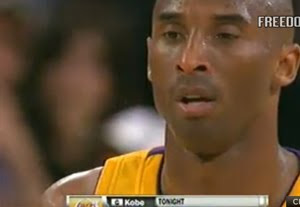 June 17, 2010 11:47 PM ET: The score is now 79-83 after the 2 perfect free throws from the Lakers. 11 seconds left! Everyone's heart is pounding real fast right now! 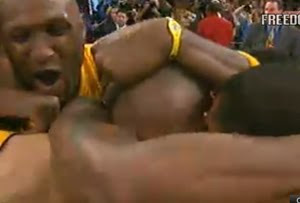 June 17, 2010 11:47 PM ET: The Los Angeles Lakers won! Wow! What a game! The final score is 79-83! Congratulations LA Lakers! 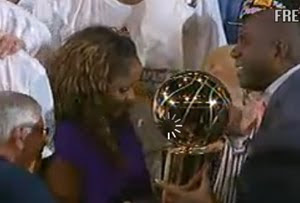 And here's the trophy for the 2010 NBA Champions, the Los Angeles Lakers!